A California fitness center in District 7, Ho Chi Minh City is being accused of fraud by selling years-long membership despite knowing its locations would be closed after April, with its representative pledging a refund for the accusers. Hundreds of clients who have paid large sums for membership ranging from five years to a lifetime in duration are being asked to train at a different location, much to their displeasure. The Cali Centuryon Central, located at the Crescent Plaza building on Ton Dat Tien Street in District 7, is among the most modernly equipped locations of the fitness and yoga franchise. Nguyen Thi Tram Anh, a resident in District 7, said she had bought a lifetime California membership at Cali Centuryon Central for VND215 million (US$9,460). In addition to the initial payment, she is subject to a yearly fee of VND5.6 million ($246) to maintain her membership card. Anh also paid for a personal trainer with whom she still has 104 outstanding training sessions, worth around VND50 million ($2,200). She was therefore frustrated to be given only a month’s notice about the center’s closure at the end of April, and that members like her would have to train at a different location in the California franchise. “I paid for membership at this gym because it is only a short walk away from my house,” Anh said. According to another member Pham Thu Ha, the fitness center had made no mention of their upcoming closure when persuading her to buy a five-year membership just recently. “If they cannot keep the current location in operation, they have to make a refund,” Anh said. Membership at Cali Centuryon Central can cost 3-5 times more than in other locations of the California fitness and yoga club due to its better equipment, infrastructure and service, Anh explained. 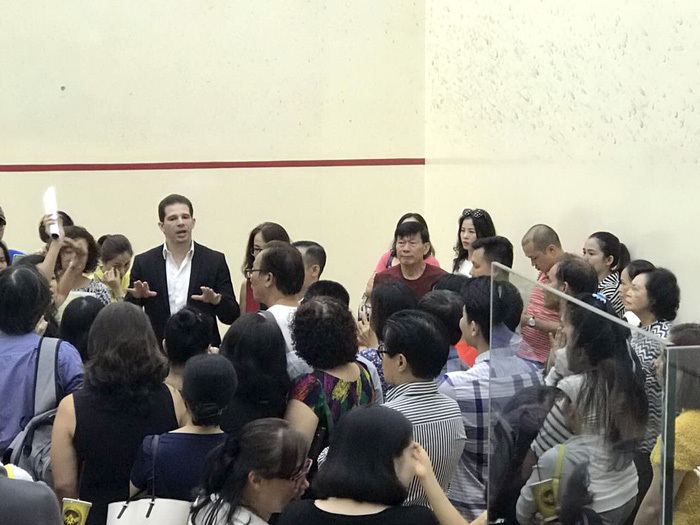 In total, Anh estimates that there are around 500 members who have paid to train at the location for five years or longer, not to mention many other short-term members, who would be affected by the gym’s closure. CMG, which operates California centers in Vietnam, will have its lease for the Crescent Plaza location terminated after April 30 as it has failed to secure another lease term. Despite having received a letter from their landlord confirming this termination on March 21, CMG continued to sell memberships of five years, ten years or even a lifetime of training at Cali Centuryon Central to unknowing clients after the date. “How is it any different from a fraud?” said Bui Thi Thanh Huong, a California member who is calling for signatures on a petition demanding that the company explain their wrongdoing. Her petition has received over 200 signatures from fellow gym goers, but no response from CMG has been made. Meanwhile, a CMG representative told Tuoi Tre (Youth) newspaper that an official written response will be sent to its members on Monday, and that it would do its best to protect clients’ rights. The representative explained that the company did not inform its members of the closure earlier because it was “confident” the lease could be negotiated for extension. “New members who recently entered into contracts with us will be considered for a refund,” the representative said.